With the help of David R. Nelson, he worked out a theory of two-dimensional melting, and predicted the hexatic phase. He also contributed to the Quantum Hall Effect, which has to do with two-dimensional electrons. Hexatic Phase: The hexatic phase occurs between solid and liquid in which two transitions take place. The first occurs when the solid undergoes a dislocation unbinding transition to the hexatic phase. The second is the disclination unbinding transition to the isotropic (liquid) phase. A dislocation unbinding transition occur as a defect within a crystal structure. 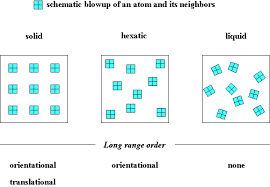 Basically, dislocations are areas where atoms are out of position and they are generated and move when stress is applied. Quantum Hall Effect: This is observed in two-dimensional electron systems that are put under low temperatures and strong magnetic fields. Basically, it has to do with resistance as a function of integers or fractions.